There’s a story in the July 21 online edition of the Boston Globe about a trial in which jurors have asked 281 questions, and in my opinion, the piece skews rather negatively about the whole practice of allowing jurors to ask written questions during trials. That’s wrong: Juror questions are a good thing for you, Counsel, and you should be enabling them in every one of your trials. I’ll pause here for you to read the article here, then come back for the dissection of some of the views in the piece. First things first: I love Boston and Massachusetts, have long ties to that city, am an American Revolution aficionado, and gave my son the middle name of Adams in honor of the single most important figure for American Independence not named George Washington. But there are times that its perpetual Eighteenth Centuryness is frustrating and wrong-headed. Its treatment of citizens who are working hard to perform one of democracy’s crucial functions is one of those instances. They’re thinking it, so why would you refuse to know that? We know what we know in the Twenty-First Century and there is no intelligent reason to pretend otherwise. Law World has enough of a fetish for the Nineteenth Century codes of evidence and procedure, which lawyers are trained to revere still—object to everything you can just because you can, regardless of the proven self-defeating effect it has on jurors; seek instructions to “disregard that testimony” despite the fact that we know that only highlights and emphasizes the improper evidence in jurors’ minds. We actually believe that evidence rules such as “relevant,” “material,” and “foundation,” have anything whatsoever to do with how the human brain actually learns, stores, processes, or decides. It is not even discretionary with the judge, as it is in Massachusetts. It’s a basic expectation associated with treating jurors like thinking, functioning adults whom we’ll treat as such and not lab rats we can control. In California and elsewhere I’ve seen it done, it’s a basic procedure: judge receives a note, usually passed along by the bailiff at a break; at the end of the break but before the jury is brought in, the judge reads it to the lawyers; counsel has a chance to object to the question being asked of a witness; the lawyers whisper to their clients not to worry about it, it could mean anything or nothing, this happens all the time, did I mention you look great today; the jury is brought back in and the judge says either, “Thanks for your question; I will read it to the witness when we resume,” or “Thanks for your question. I certainly understand why you might want to know that, yet there are reasons that I won’t be asking it, and I ask you not to wonder about why not.” Easy, peasy, don’t get queasy. The notion from the Boston article that someone might feel “slighted” if their question is not posed is a wholly imaginary fear; in reality, they are fine and they roll with it. After New York State instituted written juror questions, a 2005 statewide study found that the average number of questions posed by jurors was 2.5 per civil trial and 4.7 per criminal trial, adding but several minutes to the length of a trial. Upshot: insignificant downside for more clarity and understanding by the people who have to reach verdicts. Qualitatively, the study found that attorneys who had never been in a trial in which jurors could submit questions were skeptical and fearful of the questions for all the reasons this Boston story cites: becoming advocates, tipping off the opponent, damaging the case. Yet attorneys and judges who did work trials with juror questions were overwhelmingly positive about the innovation. They Have Over 200 Questions. Hmm . . . Whose Fault Might That Be? Back to the story from Boston. The number of questions posed by jurors, 281, is indeed a surprisingly high number. I’m guessing unprecedented anywhere by a wide margin. I disagree with the figure as given, though: that number includes things like jurors asking for office supplies, a court procedure manual (weird), the prosecutor’s name, and clarifications of some legal words such as “racketeering.” Those are not questions to be posed to witnesses, so I would count those separately. They do, though, reveal an active, engaged group that is taking their job very seriously and which is already contemplating how to do their work once they are sent to deliberation. And if trial teams were entirely honest with ourselves, we might acknowledge that questions from jurors after a case closes– that is, questions about the instructions, definitions, or the meaning of evidence – reveal that maybe we did not entirely do our job during the trial. Maybe we did not understand the ambiguities we were leaving or creating. Maybe we didn’t anticipate the gaps we were leaving. Maybe we didn’t do a good enough job of seeing our case through the eyes of laypeople who had not spent the previous two years with the case. 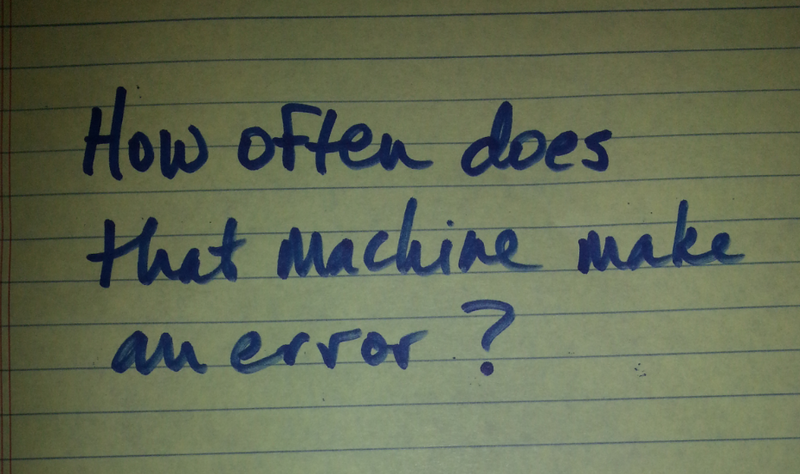 When the number of questions climbs above maybe ten, perhaps we have to accept that some of that is our fault. Oh, you thought they don’t wonder about things unless they are told about it in evidence? 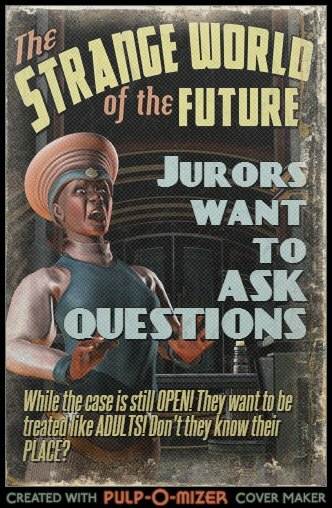 A moment of empathy, please, with citizens who are out of their element both with the facts of the case and the mechanics of trials, with the law and the inherent mystery of How To Be A Juror. They know they are being asked to render a life-altering answer at the end of the trial, and they are to be praised and respected for wanting to get it right, not patronized and infantilized by having the system and participants ignore their questions. Imagine being a student in a class you didn’t want and didn’t sign up for, in an unfamiliar subject, but you’re not allowed to ask questions, or seek other reference material. What do you think the results will be? It really bothers me when lawyers cling to the old Mushroom Model: keep them in the dark, throw crap on them, and expect a delicacy at the end. It’s only just recently that it has been widespread that jurors were even allowed to take notes during trial, for heaven’s sake. And it isn’t even universal. Wow. First of all, the hypothesis that a layperson’s questions about an unfamiliar subject upon which they are required to issue a solemn and binding decision with serious consequences must necessarily arise from advocacy is . . . uh . . . a novel psychological theory. Crazy, actually. That isn’t why anyone asks questions. They ask questions because they don’t understand something and they are trying to get the job right. We might remember that the subject matter experts mostly got excused during jury selection. After all, a key finding from that New York study confirms previous research from the 1990s about questions from jurors: Jurors do not become advocates, and they do not use the questions as tools to confirm their hypotheses. We are at least 17 years into this being understood in the research, notwithstanding any individual’s own fears and prejudices. Truly, my sympathies to someone in so much fear. And I spend a lot of time on the defense side of things in both civil and criminal cases, and I well understand the paranoia and pessimism that starts feeling like a professional virtue after awhile. But this statement is a set of bad assumptions and fearful imagination, not accumulated experience. It isn’t even good theory, and not just because it has already been roundly disproven by tons of experience. Start with this: Her comment assumes that most questions in criminal cases would help the prosecution. There is no reason to think that. I guarantee that a prosecutor would fear the reverse. It’s just fear. If the question is, “Where was the eyewitness an hour before the robbery and what was he doing at that time?,” or “When was the last time the lab tech took a class on chemical testing?,” there is no reason to think it automatically helps the prosecution. It is easy to imagine ways it hurts the prosecution. Or the defense. But the facts are the facts, aren’t they? Ignoring their curiosity does not make it go away, and does not mean they won’t make their own assumptions. It is not a good look for a lawyer to advocate that jurors be systemically kept in the dark and barred from a basic human need just because it might help our side. There’s an old saying that to get control, you have to give up control. Litigators and judges are, by and large, a little on the control freak side. The benefit to giving up a little control and bravely hearing juror questions before the case closes is that counsel can include tailored segments in closing; include a sub-argument on why X doesn’t matter and reframe the case in a way that excludes or minimizes what they were asking about. You’re in a better position to arm your favorable jurors with stuff that will help in deliberation and take some of the gunpowder out of the other side’s jurors’ ammo. Or would it be better to just go ahead and give the closing that you wrote two weeks ago that doesn’t address issues your jurors actively care about? In the courthouse hallway after the verdict when interviewing the jurors about why they found for the other side. Or watching the foreperson on the local news explaining why they found against your client. Even if you end up objecting to the question and blocking it from being asked, why on earth would you not want to know what a juror is focusing on as one of his or her pivotal decision points? If jurors have gaps in their understanding, they fill them in on their own, they don’t just shrug and say, “welp, I guess we aren’t supposed to consider that.” There is no reason to assume that they will gladly fill those gaps favorably to your side instead of the other side. There is only upside to knowing how jurors are thinking while you still have time to do something about it. Leave a comment about your thoughts or experiences with juror questions. This entry was posted in Jury Psychology & Dynamics, Jury Research, Trial, Writings and tagged communication, jury, trial. Bookmark the permalink. 3 Responses to Questions from Jurors are GOOD, Period. Thinking outside the (jury) box. Just because it’s not easy doesn’t mean it isn’t worth doing. You make some good points. Thank you, Michael. I’m here to provoke!